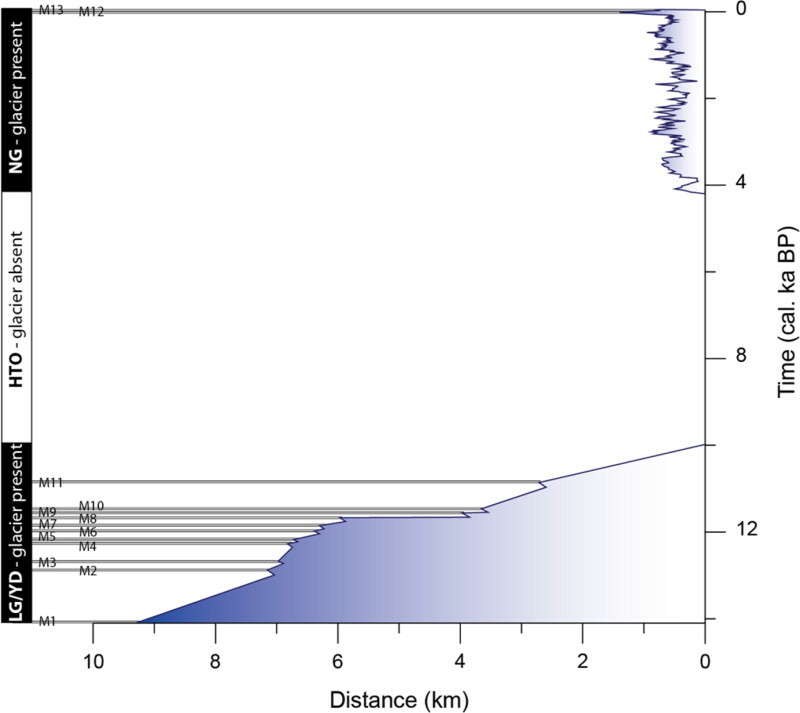 A new paper published in Quaternary Science Reviews finds an Arctic Norway glacier was smaller than the present for most of the past 10,000 years of the Holocene. For ~5,500 years during the Holocene Climate Optimum (~10,000 to ~4,000 years ago), the glacier either completely disappeared or was "much reduced" in comparison to the present day extent. The glacier began to regrow ~4,000 years ago in a neoglacial period which peaked during the Little Ice Age ~450 years ago, and which continues at present day. The paper adds to others finding many glaciers were smaller than the present during the Holocene Climate Optimum and Medieval Warm Period. In addition, other researchers have found worldwide glacier retreat has decelerated since 1950, opposite to the pattern expected if AGW was the primary cause. We link the provenance of lake sediments to sediment sources in a glacier foreland. We present a high-resolution glacier reconstruction from Arctic Norway. We use geomorphic mapping, sedimentary fingerprinting and lake sediment analyses. Holocene long-term changes in glacier extent follow trends in summer temperatures. Frequent fluctuations were superimposed on the general pre-industrial cooling trend. Late Glacial and Holocene glacier fluctuations are important indicators of climate variability in the northern polar region and contain knowledge vital to understanding and predicting present and future climate changes. However, there still is a lack of robustly dated terrestrial climate records from Arctic Norway. Here, we present a high-resolution relative glacier activity record covering the past ∼10,000 cal. a BP from the northern outlet of the Langfjordjøkelen ice cap in Arctic Norway. This record is reconstructed from detailed geomorphic mapping, multi-proxy sedimentary fingerprinting and analyses of distal glacier-fed lake sediments. We used Principal Component Analysis to characterize sediments of glacial origin and trace them in a chain of downstream lakes. Of the variability in the sediment record of the uppermost Lake Jøkelvatnet, 73% can be explained by the first Principal Component axis and tied directly to upstream glacier erosion, whereas the glacial signal becomes weaker in the more distal Lakes Store Rundvatnet and Storvatnet. Magnetic susceptibility and titanium count rates were found to be the most suitable indicators of Holocene glacier activity in the distal glacier-fed lakes. The complete deglaciation of the valley of Sør-Tverrfjorddalen occurred ∼10,000 cal. a BP, followed by a reduced or absent glacier during the Holocene Thermal Optimum. The Langfjordjøkelen ice cap reformed with the onset of the Neoglacial ∼4100 cal. a BP, and the gradually increasing glacier activity culminated at the end of the Little Ice Age in the early 20th century. Over the past 2000 cal. a BP, the record reflects frequent high-amplitude glacier fluctuations. Periods of reduced glacier activity were centered around 1880, 1600, 1250 and 950 cal. 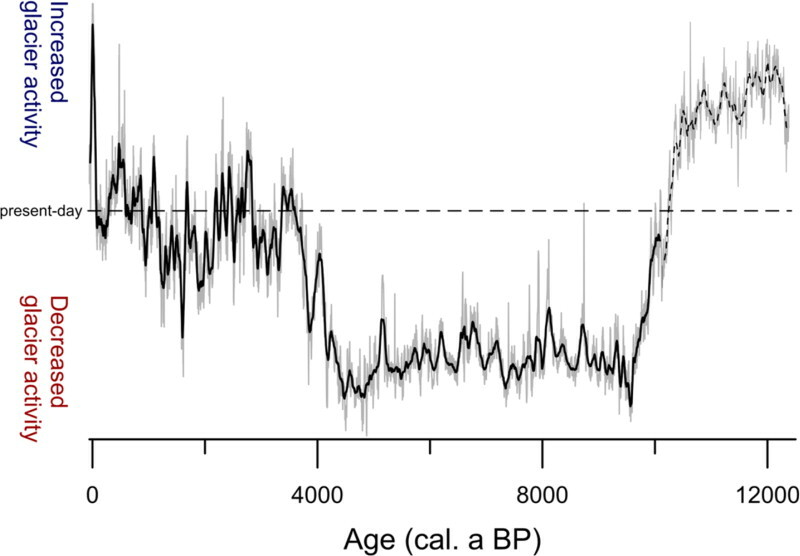 a BP, while intervals of increased glacier activity occurred around 1680, 1090, 440 and 25 cal. a BP. The large-scale Holocene glacier activity of the Langfjordjøkelen ice cap is consistent with regional temperature proxy reconstructions and glacier variability across Norway. Long-term changes in the extent of the northern outlet of the Langfjordjøkelen ice cap largely followed trends in regional summer temperatures, whereas winter season atmospheric variability may have triggered decadal-scale glacial fluctuations and generally affected the amplitude of glacier events.